A great refresh of the HD 7970, but doesn't warrant the massive price premium over the original. AMD's Radeon HD 7970 reached its six-month birthday on June 22nd 2012, and to celebrate AMD has released a card that's just, well, better: the AMD Radeon HD 7970 GHz Edition. Since it released the original Radeon HD 7970, in December last, the top single-GPU graphics card crown has slipped from its once mighty, and once mightily expensive, head. Nvidia waited, holding its breath until March, when it released its top consumer spin of the new Kepler architecture, the Nvidia GeForce GTX 680. That came in slightly undercutting the Radeon card and just about pipping it to the benchmark crown in most of our tests. Not just that but the Nvidia GTX 680 managed it with a far smaller and more efficient GPU. To most of us that came as something of a surprise. AMD traditionally had the reputation of releasing the more efficient GPUs of a generation with Nvidia usually the ones employing a brute force approach with a big, hot and powerful chip at the heart of its latest architecture. That switch wasn't the only one of this latest generation either. AMD's Graphics Core Next (GCN) architecture - which makes up the Southern Island series of HD 7000 graphics cards - was conceived with a view to creating a much more compute focused card. Previous to this architecture AMD had focused on creating pure gaming cards with only a faint nod towards GPGPU processing. Nvidia, on the other hand, chose performance per Watt for its consumer cards and sacrificed the GPGPU computing power that had been central to the Fermi architecture. This cut-down GPU though was still a great gaming chip, as the Nvidia GeForce GTX 680 showed, leaving the Tesla team, with the GK110 K20, to the pro-graphics compute shizzle. Still, it managed to best AMD's top card in most gaming benchmarks leaving it with the runners up prize. 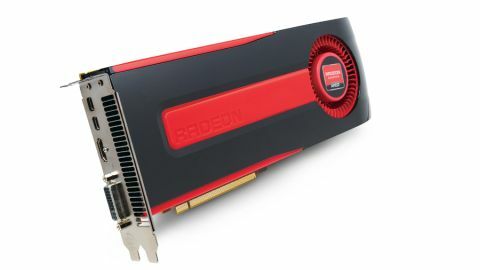 The AMD Radeon HD 7970 GHz Edition is the Texan company's counter-offer to gamers in light of the slight lead Nvidia managed with the GTX 680. And to be fair, it's come up with quite an interesting proposal. The salient point here though is that AMD has reclaimed the outright single-GPU performance crown of this generation. Obviously that's discounting the twin-GPU toting Nvidia GTX 690, which has almost cheated its way to the top of the graphics card pile. Though AMD had planned an assault on even that position, promising us the card once code-named as New Zealand. You know, the place that has two Southern Islands making up the country. Still, for whatever reason that card is off the table now with AMD focusing its efforts on bolstering the Tahiti GPU-sporting HD 7970 and making it the top single-GPU card around. So, how has it managed this feat? Well, the simple answer is overclocking. We told you it was simple. But this isn't quite the traditional card speed bump, or manufacturer-supported factory overclocked card you might normally expect. Nothing has actually changed regarding the GPU itself. AMD is still taking them from the same wafers, with the same designs, but it has taken the six months of learning that went into the subsequent Pitcairn and Cape Verde GPUs and applied it to the flagship chip. Basically the GPU manufacturing process has matured and so has the technology and, most importantly, the software. This has enabled AMD to get more top-end Tahiti cores out of the wafers and so is offering the AMD Radeon HD 7970 GHz Edition with a clockspeed of, you guessed it, 1GHz. Though that's not strictly true. In reality the clockspeed you're realistically going to get when gaming is actually 1.05GHz. That extra 50MHz coming from something AMD is calling PowerTune with Boost. The idea being similar in concept to Nvidia's GPU Boost, with some new hardware on the PCB monitoring the voltage and offering extra power, up to that 1.05GHz mark, when the thermal headroom allows. In our testing that was all of the time, even with the standard reference cooler design. Our reference AMD Radeon HD 7970 GHz Edition sat at a stable 1.05GHz for the entire time the GPU was pushed to 100% load. The only other real addition of note to the card is the 3GB of GDDR5 graphics memory has been given a bit of a speed boost too. The stock card has a 1,375MHz speed for its memory while the AMD Radeon HD 7970 GHz Edition comes with the VRAM running at a healthy 1,500MHz. That's not all though as the type of memory used has been changed too. This time it is using the faster 6Gbps VRAM over the 5.5Gbps chips it had been rocking, the same speedy memory the Nvidia GTX 680 is sporting then. Thanks to AMD's faster 384-bit memory bus though the Radeon HD 7970 GHz Edition has a massive 288GB/s memory bandwidth compared with the 192GB/s of the top single-GPU Nvidia card. That means at the higher end of the resolution spectrum the AMD card now seriously has the edge.